Saturday night, the Seattle symphony plays at the Benaroya hall. Freddy Kempf played Grieg’s piano concerto. Beautiful. The fringe from Freddy’s traditional short back and sides danced with his body movements as he pumped the piano. The piece is familair, even to untrained ears such as mine, and thoroughly enjoyable. Before the full orchestra took the stage I sneaked this photograph of the gap between the very grand Piano and the not so grand piano stool. Between them over the heads of the audience we can see the lead Cellist preparing for the evening. This scribble was published on Monday, February 12th, 2007. You can follow any banter on this scribble with the RSS 2.0 feed. You can share your inspired musings after typing the anti spam word near the bottom of the page. But no Pinging because its too naughty. 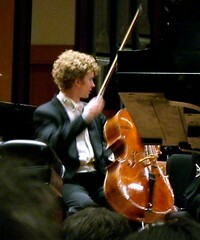 Principal cellist Joshua Roman is the best thing about the Seattle Symphony right now. I wonder, was the introduction to Grieg’s Piano Concerto long enough to let Freddy reach the piano in time? Or might it have a been a yard or two too short? Does anyone know exactly which of Grieg’s concertos that was? I’ve misplaced my program. I know it was in A-minor, but I can’t remember if it was 16, 54, or an entirely different one. Does anyone remember?